Yesterday Microsoft opened its first flagship store, using a very large space on the iconic Fifth Avenue in New York City. The company managed to fill five stories and more than 22,000 square feet with products and demos, and held a big opening day ceremony with ribbon cutting, concert and deals. This wouldn't all be possible without the OEMs, and these are making their presence felt within the space. One of those is Dell, which is quite excited about its area within the Big Apple store. The manufacturer refers to its spot as the Dell Experience. 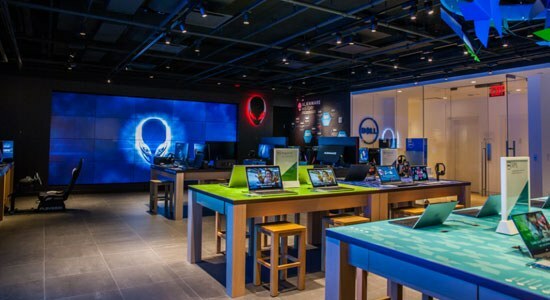 "Customers interested in Dell’s very latest XPS, Inspiron and Alienware technology can now see them for themselves in our special Dell Experience Center -- a dedicated space on the 3rd floor of the 5-floor flagship building", says Dell's Lisa Peterson. The company has set up 12 Alienware gaming stations for customers to try out, complete with 34 inch curved monitors for viewing the action. Customers can also make music videos and create art using the Inspiron and XPS systems. "In general, when shopping for new technology, consumers have a ton of choices on the market today. Dell has joined the Microsoft store to together feature the very best Windows 10 product offerings available. Via this interactive space, The Dell Experience at the Microsoft Store will allow visitors to get hands on with and explore Dell’s innovative products, especially small business offerings and Alienware gaming products, in a fun, immersive way", states Dell's Phil Bryant. The store is open now if you happen to be in the area. It is the 110th Microsoft store with locations that span the US, Canada and Puerto Rico.